“Dad, there’s your favorite word again,” my son calls out, a tad cynically, when we are driving to school listening to NPR and a reporter uses the word innovation. I am aware that my son, and others, believe this word has become too much of a buzz-word and perhaps a fad, too often so broadly defined that it becomes generic, empty in content, and devoid of true significance. But, I refuse to be deterred. Like Tom Friedman in the New York Times, President Obama, and many others, I think the word and the concept capture and describe something both wonderful and incredibly important in our world today– and in fact, more important than ever before in our fast-changing times. Educational innovation, and, more importantly, educating students to be innovative, are the intertwined twin concepts I spend the most time trying to learn about more deeply, understand better, write about more often, and implement more effectively. Looking back, I recognize now that the slogan change made in my first months (2009) at my school, St. Gregory, by the Board of Trustees and myself, came too soon and too abruptly, without enough preparation and inclusion, and I regret the rushed process. But, nevertheless, I love the phrase which adorns our website, brochures, and advertisements and which looms large on the walls of our major meeting areas: Creating Leaders and Innovators. Creating Leaders and Innovators stood proudly tall in foot-large letters high up on our gymnasium wall in 2010 when Tony Wagner, Ph.D., visited our school and spoke beneath this banner to an audience of nearly 500 about the educational change our fast-changing world demands and how we can bring about this change. 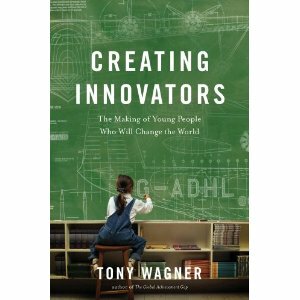 So it should be no surprise that I am greatly enthusiastic about Dr. Wagner’s forthcoming book, (April, 2012),Creating Innovators: The Making of Young People Who Will Change the World. I think every 21st century educator who seeks to strengthen our national and global future by teaching our students to be more creative and successful problem-solvers should put this book on the very top of their must-read list for 2012. Wagner, in introducing his topic, made reference to the new book from Tom Friedman and Michael Mandelbaum, That Used to be Us, and shared Friedman’s view in that book that in the future there will be only two categories of successful people, creative creators and creative supporters. In doing so, I found a stunning pattern I did not expect—every one of these super-innovators can identify a teacher who inspired them and helped set them on their course, but these teachers were always outliers, out of the norm, eccentrics, distinctly different from most of the other teachers. Just as importantly, these outlier teachers had a set of qualities strongly in common with each other. The 5 fundamental constants of the outliers: (paraphrased). 1. They presided over a classroom culture not of individual achievement, but instead collaboration. It is remarkable the extent to which we find again and again that innovation is deeply rooted in the power of collaboration, and we must resist the myth that inventors are creative by being solitary, uniquely creative, individual geniuses. 2. Their teaching practice was one not of specialization but instead entirely multi-disciplinary—that is the norm of teachers who cultivate innovative mindsets among our students. The classrooms where they were wide-ranging, covering many topics and subjects, without regard for narrow disciplines or boundaries. 4. They promoted the value not of consuming, but creating. Their classrooms were places where students worked hard, and were serious about producing genuine, concrete, meaningful product. 5. They employed not extrinsic, but intrinsic motivation with their students. Again, as above, I should reiterate that how eager I am to see the book, and how much inspiration and information I think we will find in it. This is just a sneak peek which I hope will whet your appetite as it has mine. 1. It seems to me that every school-leader who cares about cultivating innovative mindsets and creating innovators should take Wagner’s counsel and check our leadership carefully: are we aware of who the “outliers” are on our faculties? Do we have enough of them? Are we recruiting them, and are we protecting them? Are there enough opportunities for them to “break-out” and innovate? 2. We should ask about our students: do they have enough opportunities to take risks, and learn from failure and by trial and error? Are we asking them often enough, and pushing them vigorously enough, to generate and produce real product, to create rather than consume? 3. Collaboration is essential: Dr. Wagner emphasized this repeatedly in his presentation, and certainly Steven Johnson, author of Where Good Ideas Come From: A Natural History of Innovation, agrees. But how do we distinguish, and help students distinguish, between quality and mediocre collaboration, and how do we help them develop the skills of effective collaboration that stimulates and supports innovation? The recent and important book Academically Adrift provides research findings that students are more successful demonstrating the thinking skills evaluated on the Collegiate Learning Assessment (the CLA, the exact counterpart and analogue to the secondary school critical thinking assessment, the CWRA) when they study alone than when they study collaboratively. These findings don’t dictate to me that we should abandon collaborative learning environments, but that we need to work harder to help them be effective and powerful learning experiences for our students. 4. Schools will always need to review the role of intrinsic and extrinsic motivation and seek to find the best and ideal blend; Tony’s important research here again underscores that we should be wary of the extrinsic and promote as best we are able the intrinsic. A recent Atlantic magazine article by Lori Gottlieb, How to Land Your Child in Therapy, seemed to suggest that schools should not hesitate to award and reward highly accomplished students, because it is useful for the other students to realize their limitations early and not be deprived important life lessons of disappointment. But it is the award recipients, we can see from many research studies, who can be deprived their own sense of intrinsic motivation when we grant them awards and shower them with praise: my concerns and hesitations about the culture of “award-giving” in schools is based more on what awards do to the winners than what they do to the losers. My thanks go to Tony Wagner and to EdLeader21 for the fine webinar. Readers can expect to find more here about this new book after its publication.